The hotel rests among the typical backdrop of the elegant Florentine hills with cypress, strawberry tress, brooms and pines; the smell of lavender and rosemary along with the intense colours of roses and geraniums add to the spirit of the place. The country estate has a gated car park and is itself gated; only those authorized can pass through the monitored gate, guaranteeing privacy and safety for the guests. A lovely pool located in a quiet and private location and available to guests from May to October; with a wide solarium with lounge chairs, offers a relaxing and toning break during your visit to the beautiful Tuscan countryside. Staying at Relais Marignolle means getting away from the city's often chaotic traffic even though it is just 3 kilometers from downtown and 3 from the Florence-Impruneta highway entrance; this lets you spend more time relaxing and perhaps ending your day with a toning bath in the lovely pool. Especially for travellers that appreciate style and tradition, Marignolle Relais & Charme, like the other top hotels in Florence, offers luxurious rooms or junior suites in a refined environment with superior comfort and impeccable amenities that make it a top quality boutique hotel in Florence. Breakfast is served in a large gazebo whose large windows are completely opened during the warm season, letting the perfumes and colors of the garden enter, giving you a pleasant sensation as you start your day. During the winter, the heated gazebo becomes a comfortable "winter garden," letting you enjoy direct contact with nature even during this time of the year. From the buffet, you can taste exquisite local marmalades, whole grain breads, fresh rolls, hot croissants and delicious homemade cakes or, upon request, scrambled eggs, bacon, and cheeses, served with courtesy and professionalism with elegant porcelain and silverware in perfect Florentine tradition. "The hills immediately surrounding Florence, dotted with stately villas and country homes dating back to the Renaissance, offered Florentine aristocrats cool respite in summer from the higher temperatures in the city below. 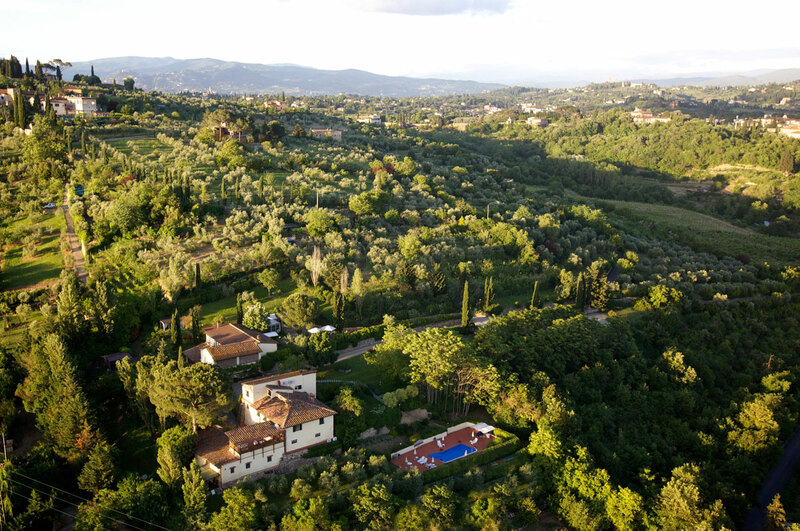 The gracious Bulleri family chose this alternative to the city some 30 years ago, and after a successful career in the fashion industry, Claudio and Paola transformed their splendid wooded property into a top-notch inn for discerning guests..."